I’ve since expanded my prebiotic mix to include hulled purple barley and rye berries. Together with oat groats and beluga lentils that forms the base for many sweet and savory dishes in the Greger household. Mmm, this video is making hungry. But what about the phytates? See Phytates for Rehabilitating Cancer Cells (https://nutritionfacts.org/video/phytates-for-rehabilitating-cancer-cells/) and Phytates for the Prevention of Osteoporosis (https://nutritionfacts.org/video/phytates-for-the-prevention-of-osteoporosis/). Have a question about this video? 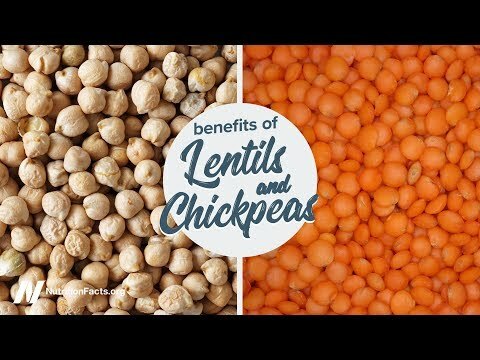 Leave it in the comment section at http://nutritionfacts.org/video/benefits-of-lentils-and-chickpeas and someone on the NutritionFacts.org team will try to answer it. Want to get a list of links to all the scientific sources used in this video? Click on Sources Cited at http://nutritionfacts.org/video/benefits-of-lentils-and-chickpeas. You’ll also find a transcript and acknowledgments for the video, my blog and speaking tour schedule, and an easy way to search (by translated language even) through our videos spanning more than 2,000 health topics.